Hi Everyone! 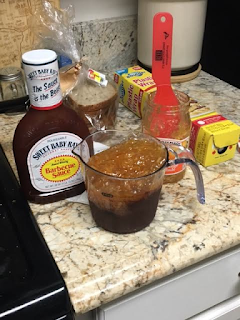 I wasn't exactly sure what I wanted to make for dinner the other night. I knew we were going to have chicken... But I was kind of sick of all the chicken I had made so I decided to make this orange chicken recipe I found on Pinterest a while back! (I will post link at bottom of post). 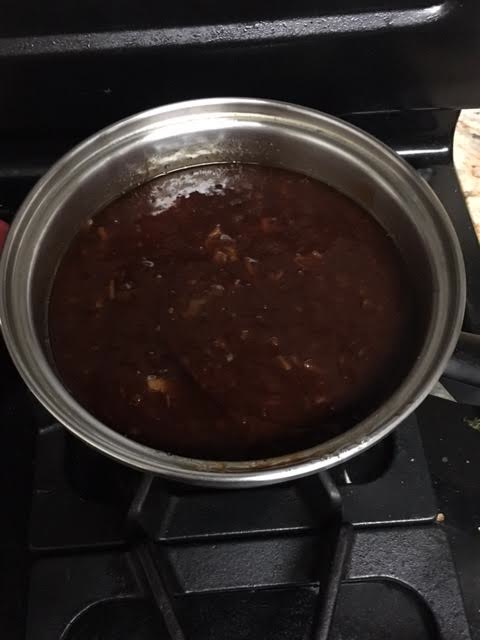 The sauce was very simple to make! The time consuming part was the chicken. The recipe wants you to fry the chicken. But, since I am trying to eat on the healthier side I decided to bake the chicken.. Although half of the chicken I dipped in egg, flour, and breadcrumbs and baked it that way, the other half I just baked regular. 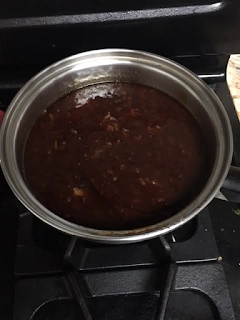 The sauce was just BBQ Sauce (1 cup), Sweet Orange Marmalade (the whole can), 2 Tablespoon of Soy Sauce. Note:: I don't like my orange chicken very orange... I like mine with a hint of orange... So next time I would probably just use half the jar. I dumped everything into the mixing cup and then dumped it into a pan to cook. I had it on medium low heat. I just let it heat up while I started preparing the chicken. 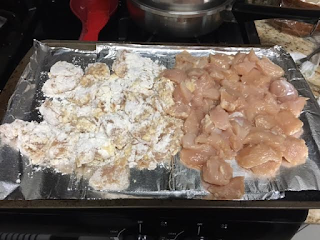 I cut up all chicken into bite size pieces. Like I stated earlier I did half in the egg, flour, and bread crumbs. and half just the chicken. My boyfriend said he actually liked the coated ones better, I baked all the chicken together. I put that in the oven to bake at 350 degrees for 25ish minutes. 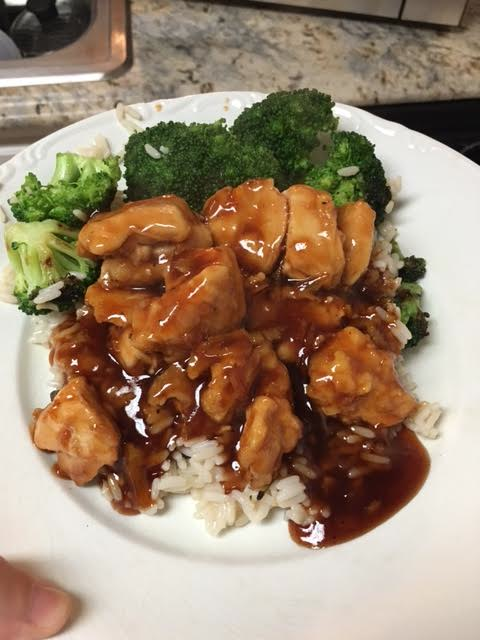 While the chicken was baking I made the white rice and broccoli. I took the chicken out and dipped the chicken in the orange sauce. My boyfriend loved it! I wasn't totally sold... I would do half the orange, a nicer BBQ sauce, and probably add water to the sauce. However it was a pretty delish meal! !